Two weeks from the fall finale and Gotham finds itself in what can be cautiously referred to as a groove. After the season’s worst episode, the dismal fourth entry “Strike Force,” the Fox drama rattled off a string of hours ranging from competent to genuinely entertaining. 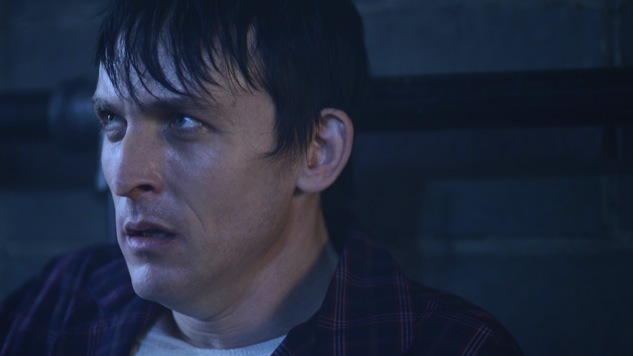 Last night’s “A Bitter Pill to Swallow” was perhaps the best of the bunch and the uptick in quality can be attributed to one key factor: Gotham has embraced its crazy side. The show has always been a safe haven for lunatics, but throughout the first season and on into the second, it tugged itself between low camp and high drama. Nine episodes into the sophomore campaign, the writers appear to have learned they cannot compete in the high drama weight class, as episodes have grown larger and more batty. Given the personalities that inhabit the city, the shift to a clearer and campier tone is good news. No longer do the likes of Oswald Cobblepot and Edward Nygma have to alter themselves in an attempt to bring class to a show that is the television equivalent of a dive bar brawl. All of the weird and wicked villains can let their freak flags fly. ?Hopefully they’ll do just that, and soon. The biggest disappointment of the so-called “Rise of the Villains” season has been its confusing lack of intriguing villains. Theo Galavan and his sister Tabitha are duds, Barbara is in a coma and Jerome (plus the rest of the Maniax) is long dead. That leaves us with pre-established Penguin, and the evolving Edward Nygma. Thankfully, the two are delivering of late. Once again, Cory Michael Smith has seen the biggest upgrade from Season One to the present, thanks to the progression of Ed from socially awkward medical examiner, to liberated serial killer. Smith is having a ball in Season Two, and last night’s interaction with Penguin was one of the year’s biggest delights. A meeting between the two was long-teased last year with the ultimate payoff underwhelming. “A Bitter Pill to Swallow” satisfied the initial craving for a Riddler/Penguin screen clash, and with Ed’s villainy in full swing, the two should find themselves together more often. The episode was, however, not an Ed and Oswald lovefest (sadly). Instead, it centered around an action set piece. With a price placed on Gordon’s head, the detective found himself holed up in Galavan’s high rise, fighting off would-be assassins. It was a stretch episode, certainly. Having Gordon fight for his life rather than investigate Gotham’s mayor was nothing more than a way to elongate the overarching story. But, the episode provided the series’ best action sequences, making it an effective stretch episode, rather than a bore. The elevator fight scene was the best the series has ever produced, and the subsequent action moments were also compelling. The biggest disappointment of the night was the dull squabble between Gordon and Eduardo Flamingo (Raul Castillo). It was stunted and uninspired, souring what had been a well-crafted hour. Let’s talk about Eduardo Flamingo. One of Gordon’s attempted killers, he debuted with a bang, cutting off a man’s ear à la Reservoir Dogs and then licking (maybe eating?) it. Flamingo is a disgusting character well-suited for the absurdist nature Gotham has built itself on, but I am uncertain Raul Castillo is the right actor for the job. Castillo is talented—a magnetic performer whose nuance and grace brought humanity and heartbreak to HBO’s Looking. As Richie, Castillo was often my favorite part of the show, and I was miffed at how infrequently he appeared. When I learned he was set to arrive in Gotham’s second season, I was elated. Like Michael Chiklis, I expected an actor of Castillo’s caliber to raise the level of everyone on screen, but instead he’s been wasted. Castillo’s performance as Flamingo is not bad, at this point it is far too underdeveloped for any legitimate critique to be made. There was no reason the hour could not have included a healthy dose of Flamingo, but instead it seemed uninterested with him as a character (confusing, given the startling introduction). Of course, it’s the beginning, and thanks to some maneuvering in the episode’s final moments, Eduardo Flamingo is loose. I expect his score to be settled with Gordon in the coming weeks, and I hope the writers take advantage of the gift at their disposal in Castillo. ?With the middling quality of early Season Two, I was looking forward to the mid-season break for dour reasons. Now, with a string of solid episodes leading in, the fall finale is exciting for far different circumstances. The Fox drama has been up and down numerous times in its 30-some-odd episodes, but the fall finale is a chance to prove it has made serious gains in its second year. Gotham has always folded come payoff time, so hopes should remain in check the next two weeks. If the show continues like it has of late, the fall finale could propel the drama into the second half with gusto. If Gotham drops the ball, like it has so many times before, it might signal the beginning of the end. Eric Walters is the Assistant Tech Editor for Paste and a regular contributor to the TV section. For more of his thoughts on comic book television, listen to his podcast.